The Argus is reporting that the Astoria cinema, home to my murals, could be demolished to make way for a ‘business centre’! I’m surprised there hasn’t already been a mysterious fire in the night! Too many Art Deco buildings have been demolished since I moved to Brighton, just because they are not Regency! 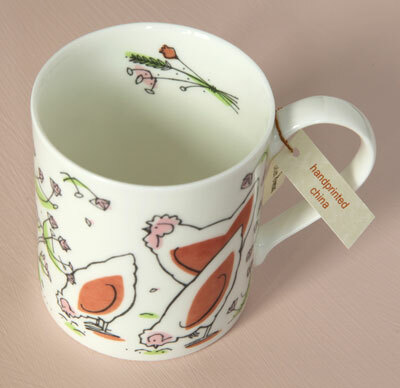 If you like hens and chickens on your breakfast mug of tea, you’ll love the Rustic range of mugs by my neighbour Belen Gomez. They are silk screen printed onto English bone china – not those clunky thick earthenware jobs you often get, these are quality. They come in five wrap-around designs, each with a detail inside, and in four different shapes. A joy to drink from! They cost £11 or £12 depending on the shape and size + p and p. And her greetings cards are gorgeous too. Can’t wait for her Seaside range to hit the streets. My interest in this? – I helped her develop the website, and very nice it is too.